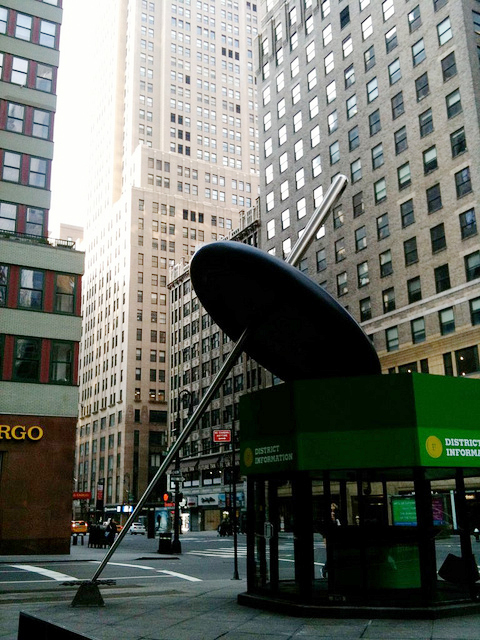 New York, New York! One Helluva Town! Oh New York, you sure do take my breath away! As someone who is deathly afraid of flying, I will always begin my con reports with details of my flight experience because the amount of agony and stress over flying equals the same amount of time and energy trying to plan for a comics show in another city. The San Francisco airport had an amusing exhibition on classic board games at my gate that did its best to calm my nerves before I had to board the plane. And, okay, the flight was fine, thanks to watching episodes of Real Housewives of Beverly Hills and a ridiculous reality show about the glamorous life of young people in the Silicon Valley which according to this show is based only in the Pacific Heights neighborhood of San Francisco (Ai yi yi). Here's the view over the majestic island of Manhattan. You can't help but overcome your fears and fall in love. Anyway, right after I got off the plane, I got a nice welcoming text from Annie Koyama. It made my heart melt because I was dreading the thought being all alone in Manhattan which is silly because, hello, 10 gazillion billion people live in Manhattan and it's definitely true what Ol' Blue Eyes says: New York is a "city that NEVER sleeps." Driving from the airport through Long Island, I could see a few signs of damage caused by Hurricane Sandy. Trees were knocked down, taking huge chunks of the sidewalk with them. Flags and signs were ripped apart. However people were still out and about which was comforting to see. I met up with Lark Pien and her sister Jane who were hanging out near my hotel in the Garment District. They were looking for buttons. Jane had suggested going to the nearby Korean fast-food joint, Bon Chon. I enthusiastically accepted because it was one of the food suggestions that my friend Annie Yee told me about the day before, and, um, HOLY CRAP, the chicken there is amazing. Talk about CHICKEN JOY (Jollibee reference)! Anyway, it was nice seeing the Pien sisters together. They told me that they had volunteered the day before, giving away food and supplies to people in Red Hook. Really cool that they did that. Lark showed me the war wounds on her arm that she got from some National Guardsman trying to fling a bag of potatoes or something over her head, or wait, I think it was from a fist fight with one of the guards. Wow, Lark. Later on, because we are pigs, the three of us met up with Annie Koyama, Robin and Dan Nishio for MORE chicken at Torishin, a yakatoriya that Robin suggested. Robin's food suggestions are always A++ and this was no different! My favorite was the pork belly and the crispy skin, and I did manage to eat one or two pieces of vegetable because I'm on a diet. What? I kept looking around in amazement. The sea of people made me really happy! Lots of people compared the feeling of this show to this year's SPX which I did not go to. 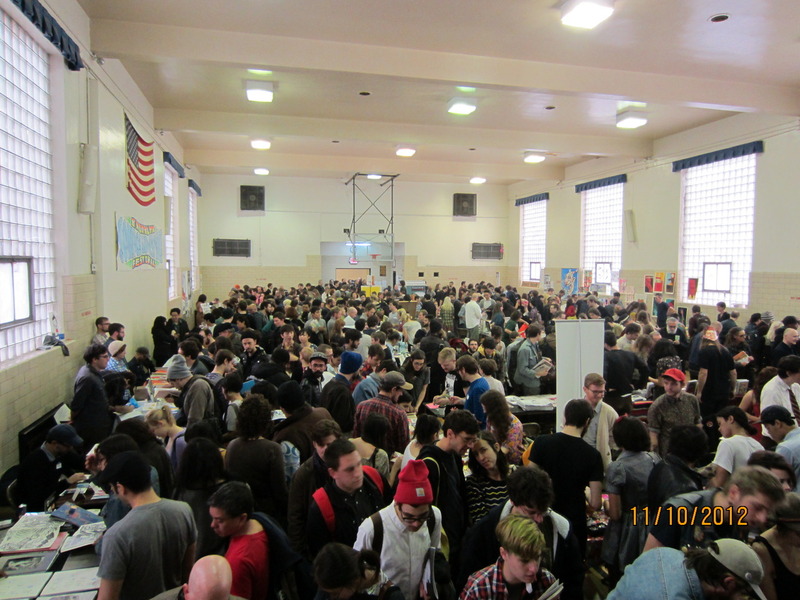 BCGF was just a great morale booster for the comics scene. I was physically hurting from the lack of ventilation due to the crowds (I'm really bad with hot weather, that's why I moved to the Bay Area), but the happiness of seeing so many people in one space, weaving through immense aisle traffic for comics made me forget how dehydrated and sweaty I was. (Also I really shouldn't have worn a sweater!). I do have one regret though which was not being able to venture out to see cartoonist heroes like Roz Chast and Richard MaGuire, or to get to purchase the awesome books from Bill Kartalopoulos' Rebus Books or Lilli Carre's debut book "Heads or Tails" -- or basically everyone's book because people who would visit our table would always be carrying something amazing. Luckily though, many were nice enough to come around to visit our table. It was a great honor to have Matt Groening stop by to pick up a Ticket Stub. He talked to Tim about his contribution to the Treehouse of Horror, Issue #15. This is a great pic taken by Lark of Charles Burns with Tim. I swore I saw Charles at Torishin the night before and when I asked him about his dining experience, he assured me that he wasn't actually there and that he has doppelgangers all over the world. One time, he found himself face to face with THREE doppelgangers or I guess that would be a dreimalganger? Anyway, I told him that "he" ate a lot of chicken skewers like a champ. It was great to finally see some of the NYC dudes that rarely come to the West Coast shows, like cartoonist, photographer, book designer Jonathan Bennett! He has been working on some strips in The Believer, but he promised that he was in the process of making more comics hopefully for next year. I can't wait! Here's Matthew Thurber and Dash Shaw. Dash expressed his thanks for having a collection of Ticket Stub published. I remembered him writing about the minicomic on the ole Comics Comics blog and I was really glad to hear that many people shared the same love of the Ticket Stub minis as I did. Lots of people were never able to actually see them since Tim only printed about 20 copies of each issue. And, oh lord, Gary Panter! 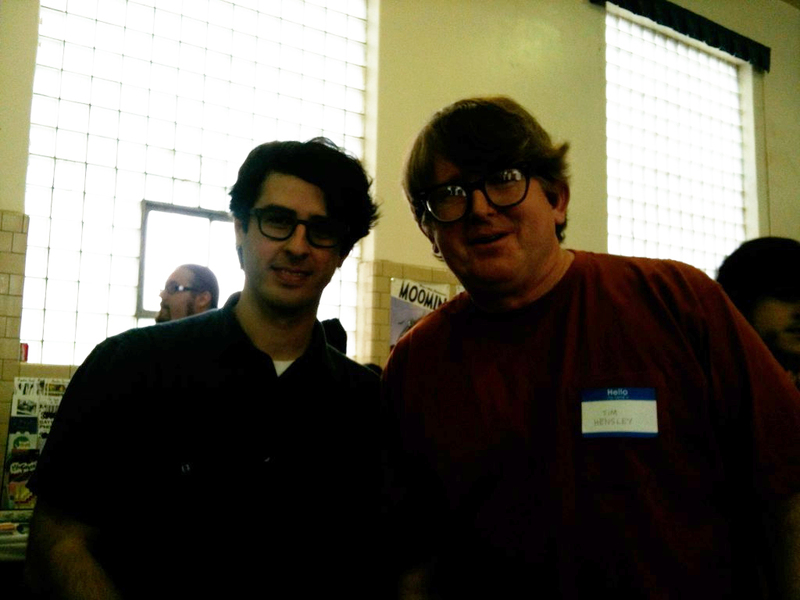 He and Tom Kaczynski were signing at the Fantagraphics table. I've been a major fan of Mr. Panter forever, especially because he says great things like this. I also got to see Tom K's new book with Fanta, "Beta Testing the Apocalypse". The colors look great and there is new stuff in there, folks! Got to get that and his latest offerings through Uncivilized Books. Post York and True Swamp, GEEZ!! 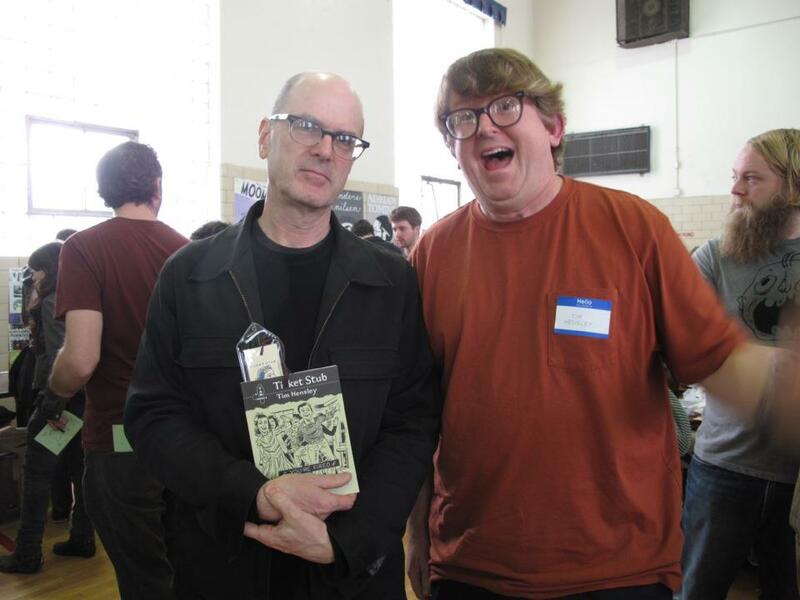 Here's a blurry Chris Ware with a Ticket Stub! I kept hearing that his panel with Art Spiegelman and Richard MacGuire was off the charts. I hope to see video of it soon! I told Chris that it was refreshing to hear at his talk with Dan Clowes at the Oakland Museum of California that he can be self-depricating about his work and talent even though he is a complete and utter genius. It was nice to see Chris Cilla's face all the way from Portland. He had these great silkscreened t-shirts at his table. Just a great guy all around! Other Portland folks like Julia Gfrorer, Zack Soto, Aron Steinke and Jason Levian were also in attendance! Adrian Tomine was able to take a break from signing at the D+Q table to get a copy of Ticket Stub. I'm still trying to figure out what Tim drew in Adrian's copy. As I was walking around, scrounging to break a 20 dollar bill for some ones or fives like a character in Walking Dead looking for food or a first aid kit, I ran into one of my favorite people, Tom Spurgeon. We talked first about sports, social media and then comics. We know our priorities. It was nice to finally meet him as it has been over 12 years since I've only known him through Comics Reporter, one of the best comics websites out there today. Tom moderated a panel with Tim, Charles Burns and Anouk Ricard. I can't wait to see video of that too! I was so happy to finally meet Nick Abadzis in person too, whose book collection of his "Hugo Tate" comic just came out last Spring. We're going to have him on the Comix Claptrap soon, so make sure you stay tuned. Yes, Thien and I are still podcasting. Sorry. Also nice to see another West cartoonist, John Pham make it the show. John had these gorgeous video game zines printed on the Risograph, as well as stunning paintings that he exhibited at Giant Robot recently. The show had a really nice mix of cartoonists in this show! Veronica Graham, from Oakland-based Most Ancient, had a table and came over to say hi! She had these insane books made out of vellum! It was also a welcomed surprise to see Damien Jay, who traveled from LA to visit his family in New York. Chris Diaz from San Francisco showed us all the drawings he got from Gary Panter, Adrian Tomine and Charles Burns. He walked away with a nice piece of original art by Tim. I got to talk to Warren Bernard, Executive Director of the SPX show about the amazing guests he had at the show two months ago. Also, I was very honored to have Nine Antico, one of the featured guests of the show, pay us a visit. In general, BCGF was a huge success for Yam Books. I can't think of a better way to end the convention season. We sold a lot of Lollygags, and Ticket Stub did really well which made both Tim and I very happy especially since the show marked the end of his Transcontinental Ticket Stub Tour. After the show, Tim and I got to stop by Desert Island. They have the latest issue of Smoke Signals which Tim has a full page spread of Alfred Hitchcock strips. You need to definitely check that out! We dropped off some books and then met up for Thai food with the ole Artist With Problems (AWP) crew: Alex Holden, Karen Snider, Jon Lewis, Tom K, Robyn Chapman, Robin Enrico, and Sam Henderson. They are always so much fun and so welcoming. It was hard to leave those guys, and hard to leave NYC in general. I could go on and on about how the next day I visited the Ripley's Believe it or Not Museum with my high school friend Becky and her family, and being mesmorized by Pierpoint Morgan's amazing library, but I will save you the trouble. I will say though that New York was really great to me. I'm still crushing on the city big time. JP Morgan had three copies of the Guttenberg Bible. That jerk! Thank you to all the people who visited and supported Yam Books at the show! Thank you to Robyn Chapman for helping and hanging out with us at our table. Huge props (can we still say that?) to Gabe Fowler, Bill Kartaupolos, Dan Nadel enough for putting together a well-curated show in the midst of chaos the past couple of weeks. And lastly thank you to Lark Pien and to Tim Hensley for making each show that Yam Books has attended this year such a success. We'll see ya guys soon at a show near you in 2013!